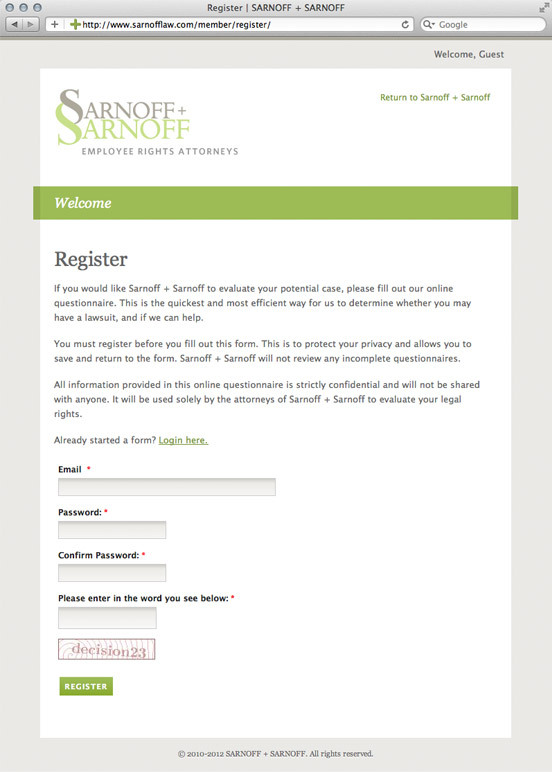 Sarnoff + Sarnoff is a labor and employment law firm in California dedicated to advancing employee rights. 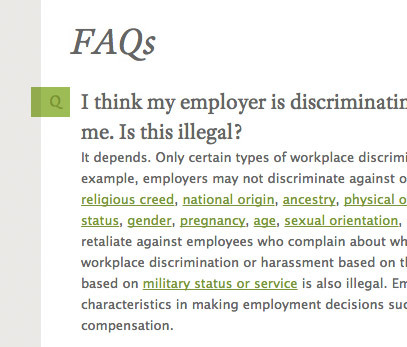 They represent individuals who have experienced discrimination, harassment, and retaliation in the workplace, as well as employees denied tips, overtime, and meal and rest breaks. 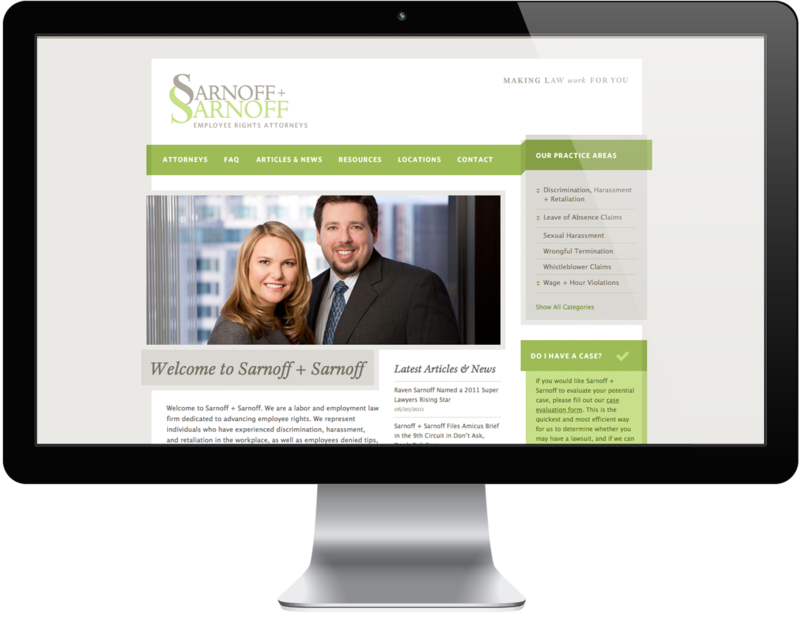 Sarnoff + Sarnoff approached Creative Soapbox to develop a Web site targeted at prospective clients. 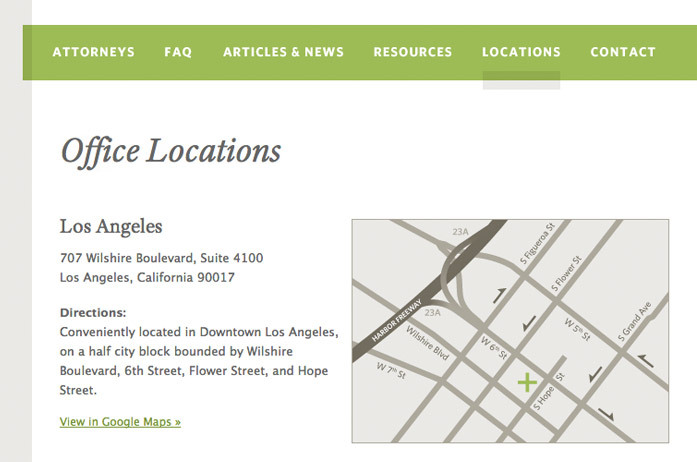 The site has a clean, modern design and features extensive information about their practice areas. They also wanted to use the site to keep people informed of their current work, which includes filing briefs in the U.S. Supreme Court. 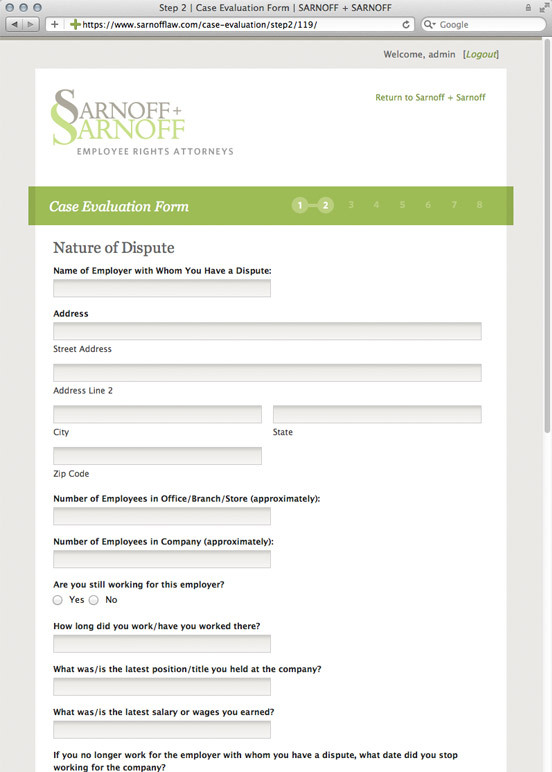 To streamline their workflow, they wanted to put their Case Evaluation Form for new clients online. Since this is a long form, we seamlessly integrated the membership signup form into the first step of the process. 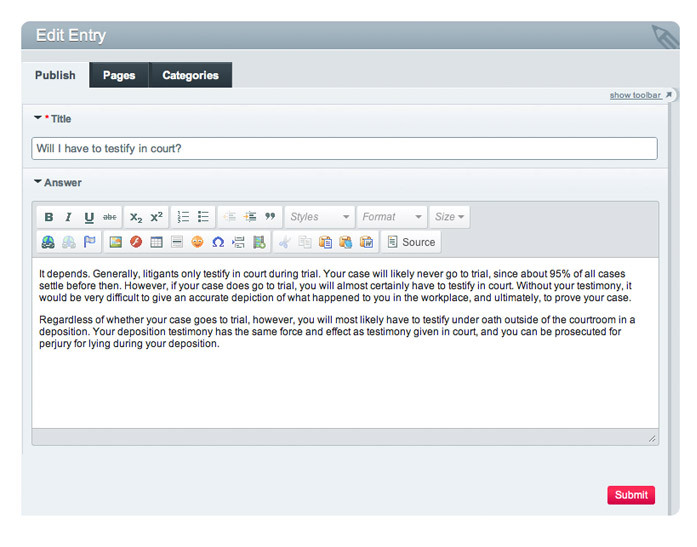 After completing step 1, the user's form data is saved at the end of each page. When a user starts to fill out the form, a notification is sent to the company. The notification contains a link to a page containing all the submitted form data and they can create a PDF of the data. All this takes place within a secure section of the site that can only be accessed by login. This site is powered by ExpressionEngine. We used some handy add-ons to add necessary functionality to the site. Barrett Newton's SafeCracker module was used to allow the user to securely create and save channel entries via a Stand-Alone Entry Form (the Case Evaluation form). Because this site involves registered members, Solspace's User module is indispensable as it allows us to create member pages in the normal EE template group/template structure. We also used Iain Urquhart's Taxonomy module to create the Practice Area sidebar list. Then of course, we put in some of the old stand-bys: Freeform, Wygwam, Low Reorder, Playa. Classics.